To purchase one of the gift boxes or make your own custom gift box call our store at (207) 368-4777. Prices are subject to change. 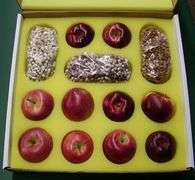 Please call the orchard store for the most recent pricing. 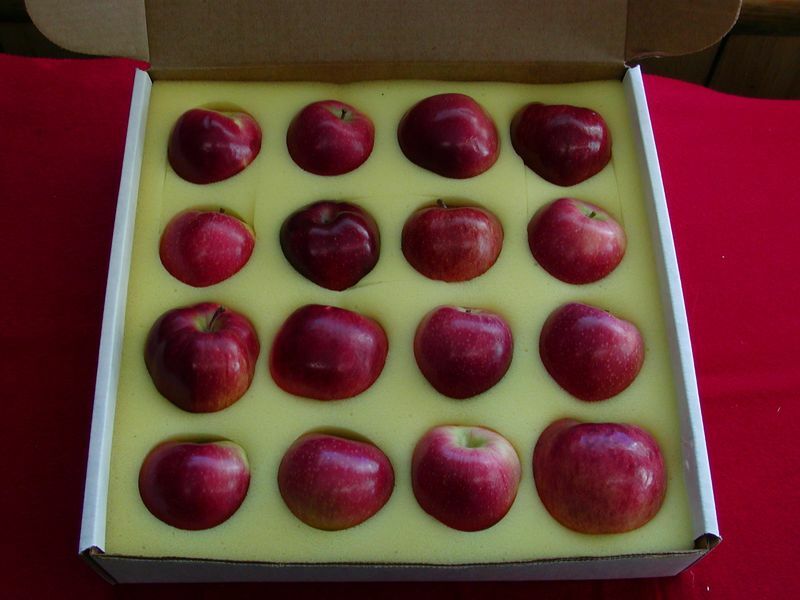 The All Apple Gift Box contains 16 fancy fruit apples of your choice. 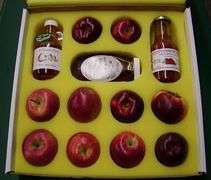 The Apples & Jam Gift Box contains 10 fancy fruit apples and three Jams of your choice. 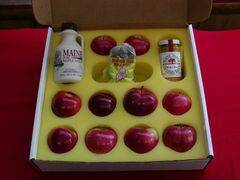 The Apple & Maple Gift Box contains 10 fancy fruit apples, one Pint of Pure Maine Maple Syrup, a package of Sugar House Maple Drops and Maine Maple Mustard Sauce. 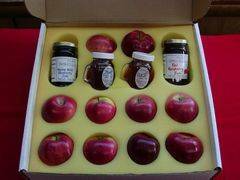 The Apple, Jam and Honey Gift Box contains 10 fancy fruit apples, two Jams of your choice, one Maine Wild Blueberry Honey and one Maine Wild Raspberry Honey. 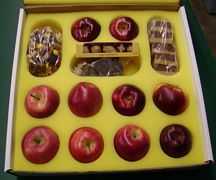 The Apple and Sweets Gift Box contains 10 fancy fruit apples, 3/4lb of Trail Mix, 5 pieces of Fudge (your choice), a package of Needhams and a package of Maple Sugar Candy. 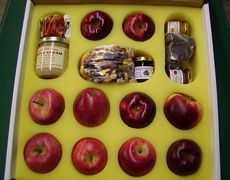 The Apple and Sweets Plus Gift Box contains 10 fancy fruit apples, 3/4lb of Trail Mix, 3 Mini Jams, a package of Needhams, Mulled Cider Mix, and a jar of Maple Cream. 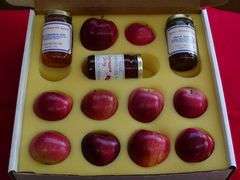 The Apple and Syrup Gift Box contains 10 fancy fruit apples, one bottle of Apple Syrup, one bottle of Strawberry, Raspberry or Blueberry Syrup and a jar of Wild Blueberry or Wild Raspberry Honey. 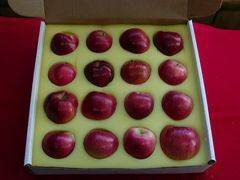 The Apple and Bean Gift Box contains 10 fancy fruit apples and three one pound bags of beans. The Honey Gift Box contains three 8oz jars of honey from Maine Maple Products. 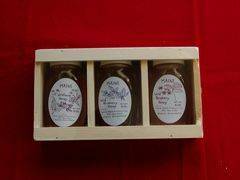 The honey flavors are Maine Wild Blueberry, Maine Wild Raspberry and Maine Wildflower Honey. 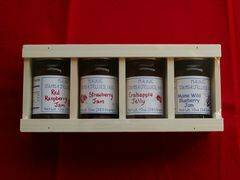 The Maine Jam Wood Gift Box contains Wild Blueberry Jam, Red Raspberry Jam, Strawberry Jam and Crabapple Jelly. The jams come packaged in a wood box. 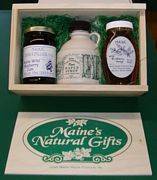 The Maine Maple Gift Box contains one pint of Maine Maple Syrup, one jar of Maine Wild Blueberry Jam and a jar of Maine Wild Blueberry Honey.